Snowboard Green: The Kicker Tool: Build Better Jumps by DMOS Collective, Inc. The Kicker Tool: Build Better Jumps by DMOS Collective, Inc. The Kicker Tool™ is the ultimate terrain-building snow shovel for ski and snowboard athletes: purpose-designed, rugged, and packable. A New Breed of Tools. The concept of the shovel has existed for thousands of years. We're DMOS Collective and we've spent the last year completely re-designing shovels for skiers and snowboarders. We've pulled in some friends along the way: Travis Rice, Tim Durtschi, Zeppelin Zeerip, Blaine Gallivan, and Andrew Burns to name a few. 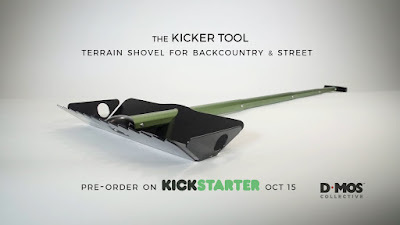 Together, we've dreamed big and designed the ultimate terrain building tool: The Kicker Tool™. The idea is simple: the tools needed to build snow-based jumps have not kept up with the rapid progression of snowboarding or freeskiing. Traditional avalanche shovels don’t provide enough shovel leverage or grooming essentials and the shovels and rakes you might buy at a hardware store aren’t collapsible, lightweight, or designed for extreme temperatures. DMOS was born to satisfy the need for pro-quality, purpose-built, rugged durable tools to build a better jump. The Kicker Tool™ is the ultimate terrain-building tool for skiers, snowboarders and groms looking to get creative, go big, and have fun. 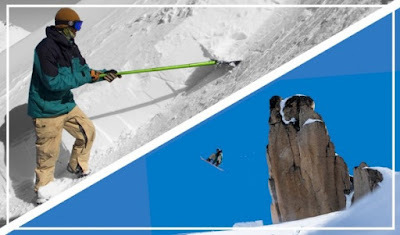 Built to last with aircraft quality aluminum alloy throughout the body of the shovel, the Kicker Tool ™ comes with a purpose built shovel head that efficiently moves, packs and rakes large amounts of snow to build and sculpt the perfect jump. The Kicker Tool™ isn't your everyday shovel - we've dreamed big and designed a bomber snow moving, jump building machine. Admit it — your avy shovel doesn't cut it. Literally. A serrated edge along the bottom lip of the Kicker Tool™ levels unwanted bumps and breaks up crud. The precision-machined teeth are sharp enough to cut snow but not your pack.